EVT is attending the Vision Show in Boston to demonstrate the latest detection, recognition and inspection capabilities of EyeVision. The established EyeVision software from EVT is machine vision software with a graphical user interface, where the user can create inspection programs with drag-and-drop simplicity. EyeVision has commands to solve every image processing application, such as pattern matching, object detection/counting, 3D and colour inspection, code reading (bar code, QR, DMC), OCR/OCV, robot guidance, bin-picking, metrology and thermal imaging. The company has now also made Deep Learning (EV DL) available for recognition of number plates and the make and model of cars, which is called VECID. The identity of vehicles is learned by convolutional neural networks, which are already pre-trained. VECID can tell you exactly, which type of car just passed through the gate of the car park and read the number based on the trained CNN, which saves you all the nuisance of configuring a conventional OCR reader system. It has also released RazerCam LS – an intelligent Line Scan Camera with FPGA processing, DualCore ARM Cortex, Power over Ethernet (PoE), USB and GigE interfaces. EVT will show its EyeVision Software with its new parallel processing function and the EyeVision 3D commands for bin-picking, weld seam or adhesive bead inspection at the Vision Show in Boston. EyeVision Parallel Processing allows for multiple runtimes with several 2D cameras and 3D sensors with each separate inspection program at the same time and with only one computing unit and session of EyeVision software. Given the appropriate computing capacity of a DualCore processor, the system will allow for faster processing, which uses up less space and is more cost-effective as it saves additional hard- and software costs. With the bin-picking command of EyeVision 3D it is possible to recognise the shape and position of any object, which has been trained into the software, locate unsorted parts in a box and pick them up with a robot gripper and send the position of each detected part in the box to a robot. 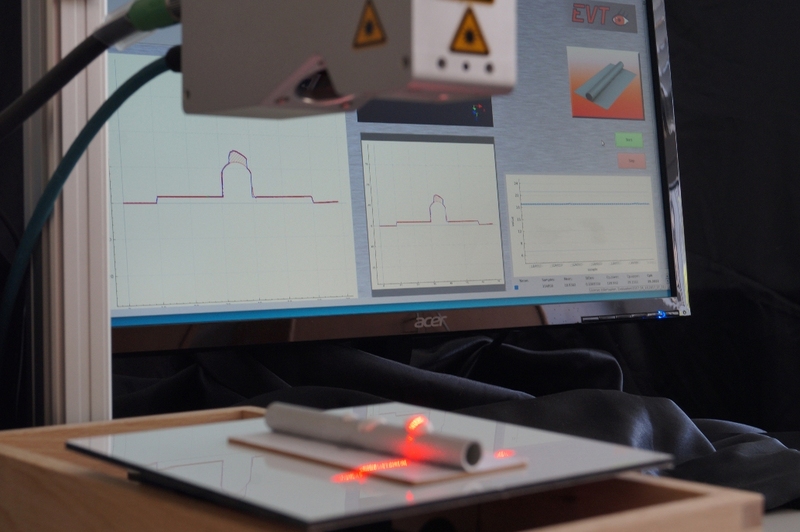 With the EyeVision 3D ProfileMatch command, the EyeVision 3D software can scan profiles, measure them and check for errors on those profiles, such as holes or warts on weld seams and adhesive beads. * Detection of cracks, holes, warts and lack of fusion.